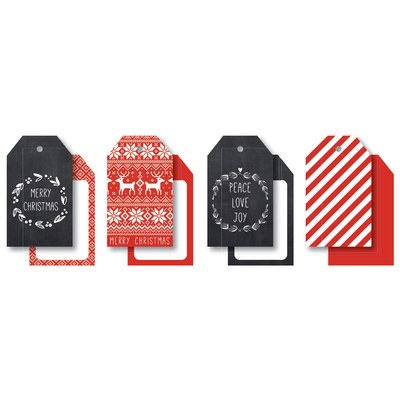 From Kaiser Craft's North Pole collection, this set contains 12 festive tags 3 each of four different designs. 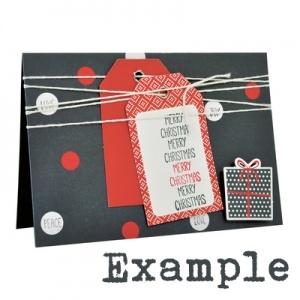 Two of the designs feature a chalkboard style design with the words "Peace love joy" or "Merry Christmas" on one side and the reverse featuring space to write a message. The other two designs are red and white coloured - one being red/white stripes and the other being a knit style reindeer and snowflake pattern and both having space on the reverse to write a message. Also included is 12 pre cut pieces of natural string. All tags are sized 5cm x 8.5cm.